Working on behalf of SES Water, Mackley completed a 12-week project to ensure the river intake at a treatment works in Surrey is fish and eel friendly in May 2017. 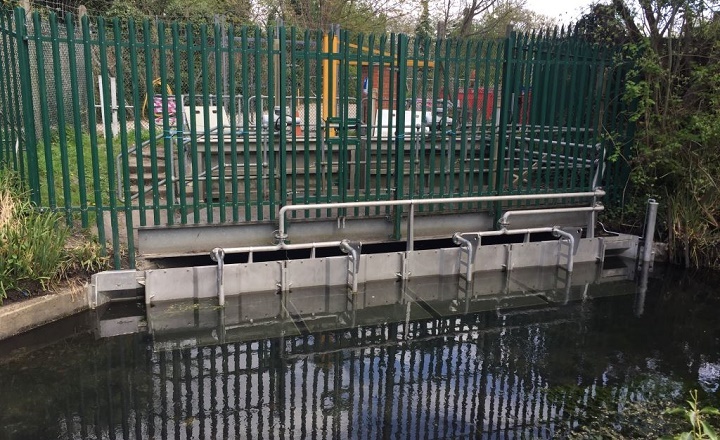 Under the Eels (England and Wales) Regulations 2009, and working in consultation with the Environment Agency, SES Water was required to install eel screens at the River Wandle intake at the Goat Bridge Treatment Works at Mitcham in Surrey. Water abstracted at Goat Bridge is partially treated and pumped upstream to Carshalton Ponds to maintain a constant flow over a gauging weir located at the ponds. This augmentation system operates throughout the year. The project comprised the installation of the eel screens together with related civil, mechanical and electrical ancillary works at the river intake, and construction of an access track for future maintenance. The design and manufacture of the eel screens was subcontracted to Eliquo Hydrok. The self-cleaning passive design with 2mm screen aperture - developed between SES Water and Eliquo Hydrok and approved by the Environment Agency - provides protection for both juvenile eels and other fish species.